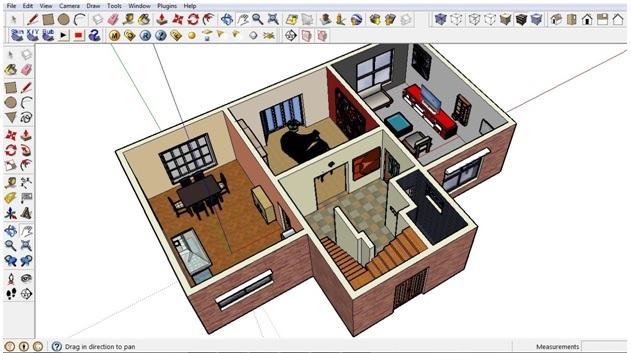 Sketchup is a helpful 3D modeling software that allows you to create and 3D shapes and objects. Using simple tools you can create customized objects with a high level of detail. There are two versions of Sketchup available. One is Sketchup Make which is free, and the other is Sketchup Pro. This section is all about free floor plan software so we're going to take a look at Sketchup Make. I know for a fact though that Sketchup Pro is used by many professional architects. I think we all first heard of Sketchup when it was part of Google's free software. Now Sketchup is produced and developed by Trimble. Due to the complexity of the software it cannot be used online. Instead it needs to be downloaded in order to use it. There's a tablet version of this software called Sketchup Mobile viewer which allows you to view and explore sketchup models on your phone. To get started, the first thing to do is to head over to the website and download Sketchup. Download the mobile viewer onto your tablet if you like. 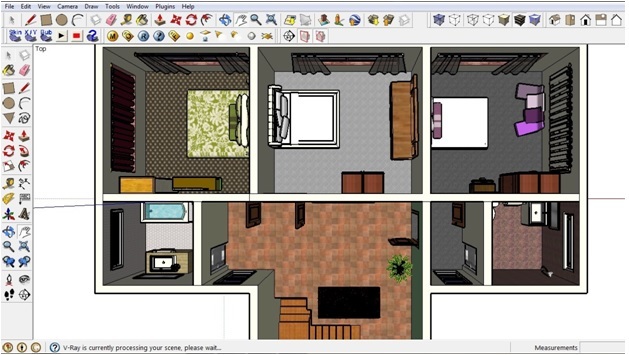 Unlike all the other floorplan software reviews I have done, Sketchup’s review will be the most different. This is because all the other floor plan applications had custom made walls, windows, doors, etc already present in the software. Where as in Sketchup, everything and anything can be made from scratch. In Sketchup there are different tools we use to create objects. The most commonly used tool will be the pencil tool, followed by the push and pull tool. 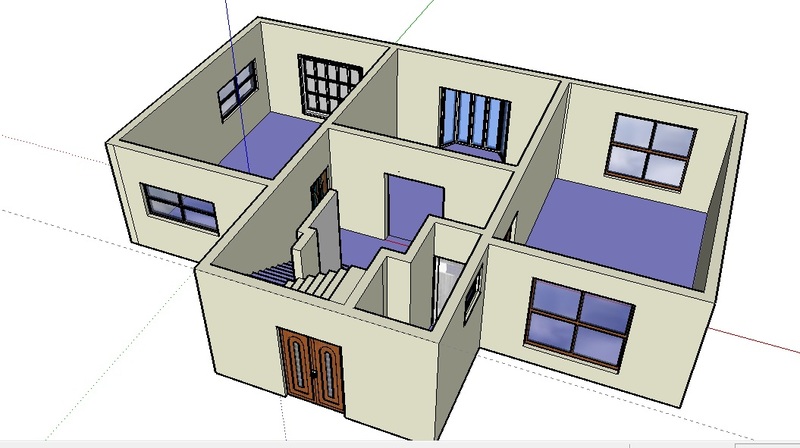 Making the plan of a house can be done in a 3D view or a 2D view. For a 2D view I simply had to click ‘Top View’ and parallel projection. Although I must admit it was frustrating to make walls from scratch at first, once I got used to making rectangles and pushing and pulling the surfaces to a certain height, it wasn’t that hard. It also allows us to make custom walls with varying thicknesses. Then use the push tool to give the rectangle 3D form with height so that we have a wall. There are three axis’s present in the software as well. The x axis is in red, the y axis is in blue, and the z axis is in red. Figure out which one is going to be your 'up' I went for blue (y). These axes really help when drawing out the shapes. With the help of these tools I managed to make my floor plan accurately. (Notice how I had to leave voids and spaces for the windows and doors, I’ll talk about it in more detail later). If you make a shape that is enclosed all sides, for example a rectangle, square, circle etc, then Sketchup will treat it as a plane surface. That surface can be extruded, pushed and pulled and more forms can form out of a simple shape. Here I had to push all the planar rectangles to a certain height. Instead of entering the value of the height again and again, after entering one value all I had to do was double click each plane to rise up to the same height. Entering dimensions is pretty easy once you know how. To enter the dimensions of the width or height or length, I had to make sure my cursor was going in the direction in which I wanted the specified length. All I had to do was type in the length and press enter. Area calculation is also very simple. All I had to do was select a plane (of which I wanted to find out the area) right click and select ‘entity info’. Can you make curved walls? Yes it is possible to make curved walls in Sketchup with the arc tool. This tool is very useful if you want to create unique spaces. With multiple arcs, one can even make fluid organic spaces in Sketchup. I made this fluid line using the arc tool with varying diameters. Then I just extruded the line with the push and pull tool to form a fluid wall. As mentioned earlier, to add doors and windows I had to leave voids in the wall. Think of yourself actually constructing the house. During construction, voids in the wall are left so that doors and windows could be added later. This is where it gets quite technical. You need to know the clear height of doors, and the lintel height of windows, so that you make the voids at the exact place where you want the windows to go. To create voids in the wall, the push and pull tool comes into use again. First we draw an outline of the window on the wall using a pencil tool or a rectangular tool, and then we use the push tool to push this plane into the wall with the same thickness as the wall. So it cuts out a perfect void into the wall. First I drew the outline of the window on the wall. Then using the push tool, I pushed the wall exactly 0.22m (which is the thickness of the wall). And there you have it! A perfectly cut void for the window! 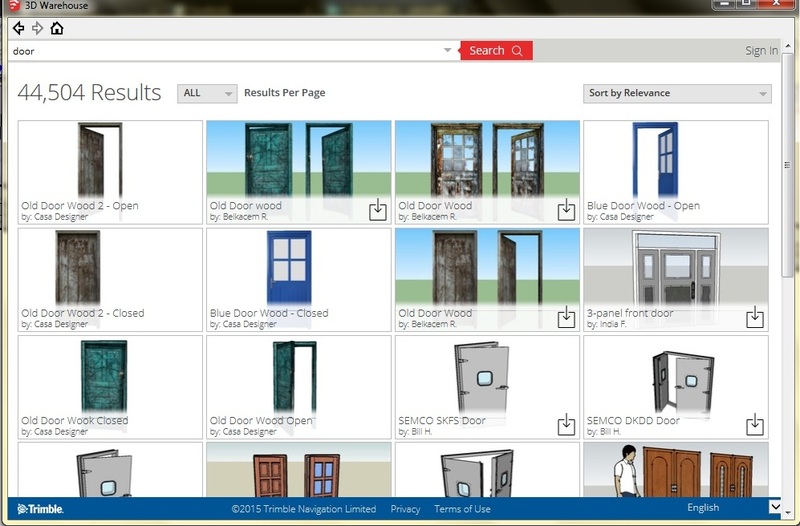 I could create my own doors and windows and doors, but as I was feeling a bit lazy I made my way to the Sketchup 3D warehouse where I downloaded some models already built model for free. So you can just download a window or a door that has already made by someone! So basically I just downloaded doors and windows of my choice and I placed them into their respective slots. The move tool came in use here. And it is helpful to grab the end of each object so that it’s easier to place them at their exact required position. For example if I grab the door from the right corner, then I would need to place it in the right corner of the slot, so that it is aligned properly. If the doors and windows don’t seem to fit, you can use the scale tool (S) for the shortcut to resize them into their desired size. I also use the push and pull tool to create stairs. As I said everything can be made from scratch, so I decided to make my own custom stairs. All I had to do was pull each rectangle (the size of one step) to a specific height. An interesting shortcut is the clone tool. To make copies of anything you just need to hold down ctrl and then drag. You can even clone a whole floor plan. All you have to do is select the entire floor and press ctrl and a tiny plus sign will come up indicating that whatever that is selected is going to be copied. With the ctrl key being pressed down click and drag the floor you want to clone and then simply drop that floor on top of the ground floor. This was the most exciting part of creating a floor plan. There's loads of furniture available in the 3D warehouse. When you finally find the right furniture you are looking for, just use the move tool to place it wherever you want. Even better is that you can edit and change the furniture to your liking. Don’t like the color? You can always use the material tool to change the color or texture. You can even delete some parts of the furniture, change the size, rotation, break it down into small parts etc. I added the second floor view as well. The more furniture you add, the heavier the Sketchup file gets though. So make sure you download light files from the 3D warehouse, as Sketchup can be a little buggy and slow down if the file gets heavy. While I added the furniture into each room, I also changed the color of the walls and applied different materials onto the floor (carpet, tiles, wooden boards). In the other floor plan software reviews designs start out as a plan, then there might be options to look in 3D. 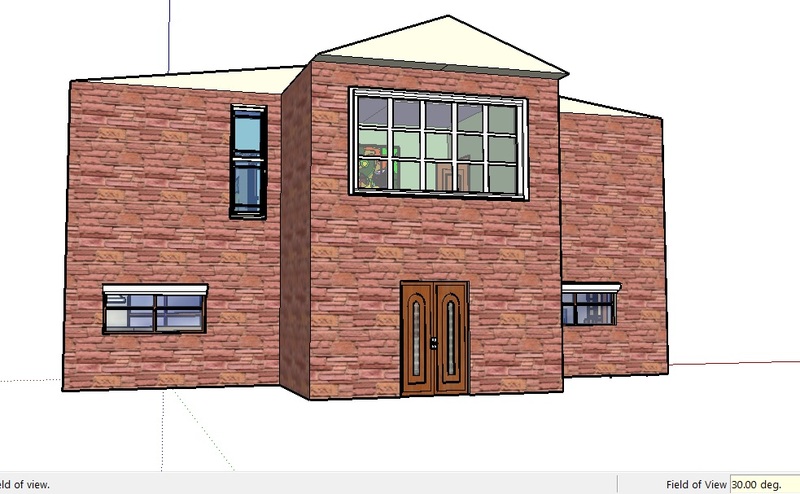 In Sketchup you're working in 3D as the design is built up. So what do you do if you want a floor plan view in Sketchup? You can use the ‘parallel projection’ option. This allows you to create 2D views of your model. 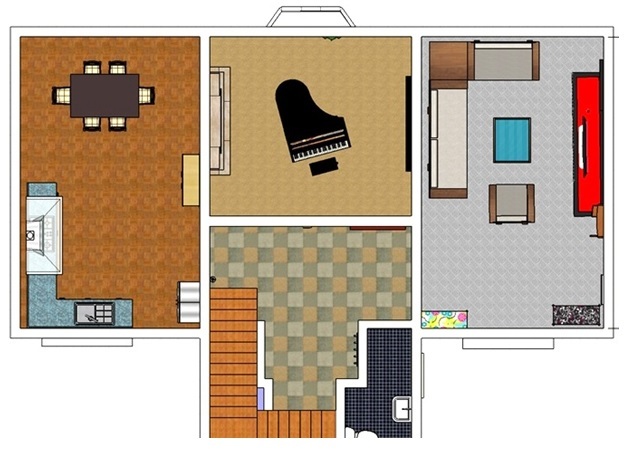 Here's an example below of the ground floor plan having parallel projection. You can use the same option to view 2D elevations. 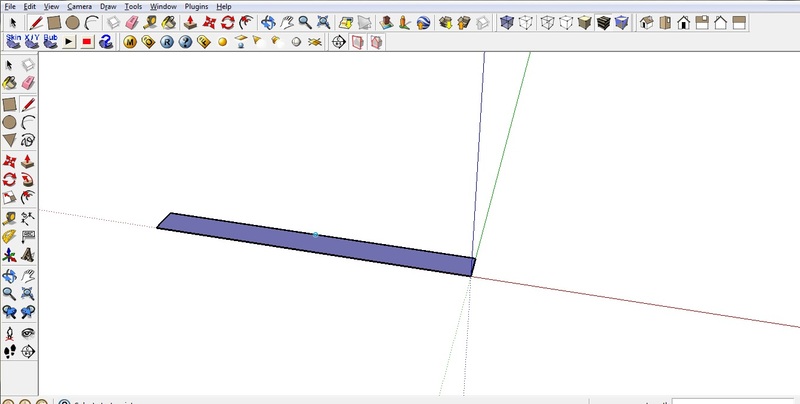 The section plane tool in Sketchup can be used to cut out sections from anywhere. Both section plane tool and parallel projection can be used to take out plans elevations and sections. Sketchup has different viewing angles and the main view where we make out models is in 3D. We can orbit around the model and can easily zoom in and out using the mouse. The field of view idea in Sketchup is interesting. 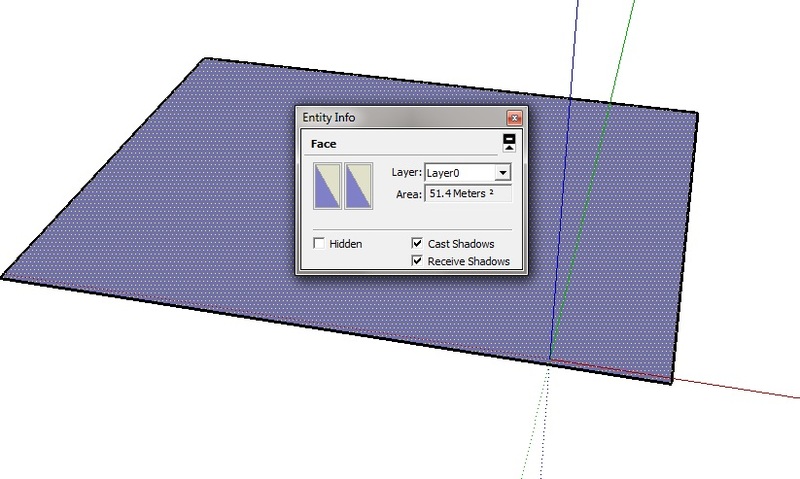 While using Sketchup I noticed that the angle at which I can see my model is 30 degrees. However the human eye would have a different field of view. Meaning the perspective of the view would be different. Here are two screenshots, the first one having a field of view of 30 degrees and second one being 60 degrees. Folks, I haven't made a huge amount of effort on the actual appearance of the exterior here - this is not my idea of a good looking house! To save the project you simply have to click save. Files are saved in Sketchup format (skp file extension). It is a good practice to keep autosave on after every ten minutes on as you never know when Sketchup can start getting buggy and may stop responding when the file starts to get heavy. Very big files can cause Sketchup to crash so it is always good to make sure your file is being saved after a certain number of minutes. 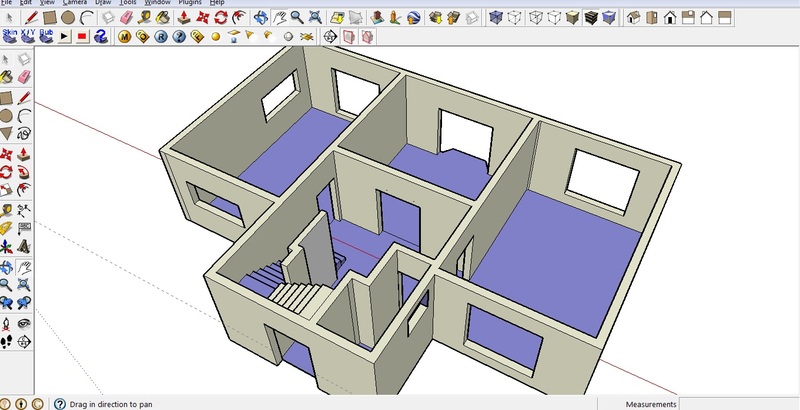 It is very easy to share your model with other Sketchup users in the 3d warehouse. For that you need to create a Google account. The free version does not allowed to import plans :( however the paid version allows you to import jpegs, cad plans pdfs and a lot of other file types. The free version doesn't have any options for exporting plans. You could I suppose email a copy of your sketchup file which someone could open in their own copy of Sketchup. In the paid version of Sketchup you can even export your model into various formats, such as an autocad file. Printing is easy. Any view that you can see on screen can be printed. If you want to print to scale just uncheck the 'fit to page' dialogue box and you can choose the scale you want to print to. For help and support all you have to do is simply go to their only help page. Or you can just click help in Sketchup. There are many options as to what kind of help you looking for. You can post in community forums, get a user guide, or even directly contact them. 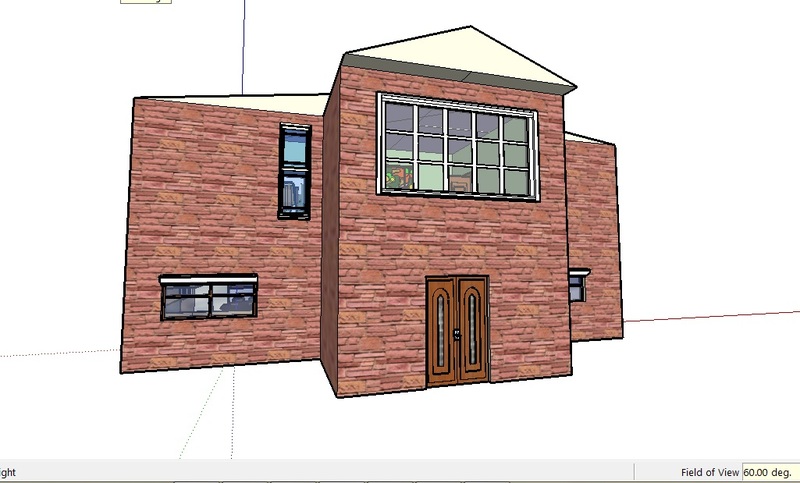 Sketchup is a very useful tool and it is constantly being upgraded. You can make anything from scratch and all you need is interest and creativity. It's more complex than other free floor plan software applications. In spite of this I rate the user interface of Sketchup as very friendly and I think that anyone can get used to this software. There is a professional version and there's plenty for the self designer in the free version. Sketchup is a powerful program so online use isn't an option. Tablet viewer for both iphone and adroid available. 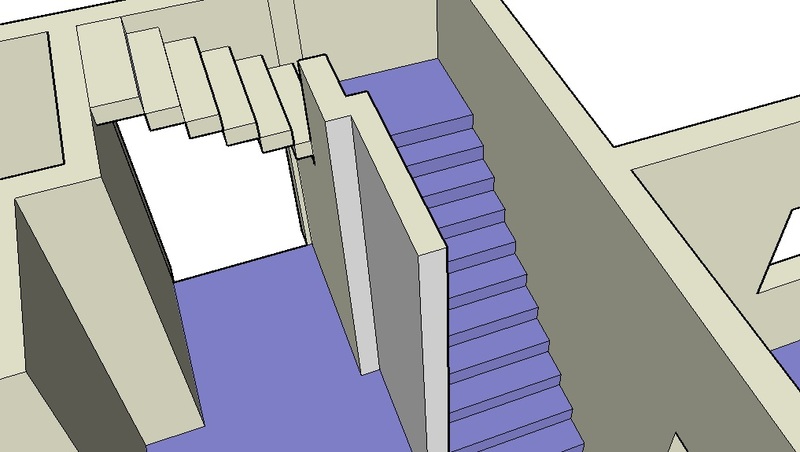 Once the height of one wall is entered Sketchup automatically matches this for other walls. The designing is all done in 3D. Not possible in the free version. Available in pro. You can print to any scale. Files are saved as Sketchup files. The pro version allows an export to common formats. I'm putting no here. You can share the file within the Sketchup warehouse but this doesn't help you to share it on social media. User guides, forum and direct contact. What do you think of <name>? I'd love to hear about your experiences using this software.